Liberty County (January 23, 2019) – Three people are dead after a head-on collision in Liberty County Wednesday evening. The crash happened around 7:00 p.m. near the intersection of FM 163 and County Road 2282. A family of five was in a Dodge Avenger. Reports indicate that the driver of the Dodge veered into the lane of a Chevrolet Tahoe causing the collision. As a result, an adult man, a 15-year-old girl and a 5-year-old girl were killed in the crash. Three other people were taken to local hospitals, two of them in stable condition, and the other in critical condition. The driver of the Tahoe had non-life threatening injuries and is expected to survive. One person from the Dodge is expected to survive. Crash investigators are still determining the cause of the accident. They plan on talking to both drivers and going back to the scene of the accident. Authorities have not released the names of the victims or if any driver will be charged. 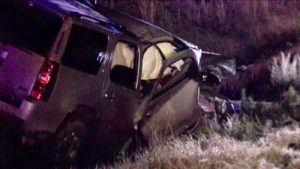 The family was heading to bible study at Crossway Community Fellowship Church when the crash occurred on FM 163 and CR 2282. Mark’s wife was waiting for the family to arrive. According to family member Darla Simms, five people were in the car: the driver, 24-year-old Brianna Henson; Brianna’s two sisters, 16-year-old Jessee Henson and 17-year-old Jordan Henson; Brianna’s 4-year-old daughter, Lilly; and the sisters’ father, Mark Henson. The Texas Department of Public Safety reports that Jessee and Mark died at the scene. Jordan and Lilly were transported to the hospital by Life Flight. Lilly died. Jordan and Brianna are in the hospital.